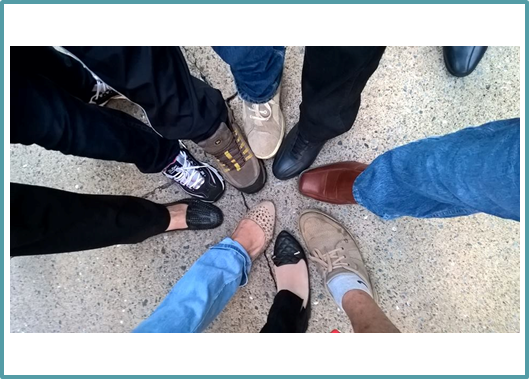 Guest contributor: Muhammad Shah Khan, A Humphrey Fellow from Pakistan studying Higher Education Administration in College of Education, Penn State University. Penn State vs. Massachusetts at the almost packed Beaver Stadium – this was the first ever American Football game that I watched. The Game was real fun to watch though I was amazed why people call it football when the players kick the oval ball only on rare occasions. Anyhow, the game was a real celebration of roughness, masculinity and merit. As I was watching this game, I was reminded of a similar sport that is very primitive and unique. Known as Buzkashi, this sport is played in Afghanistan and the Pashtun-majority areas of Pakistan. 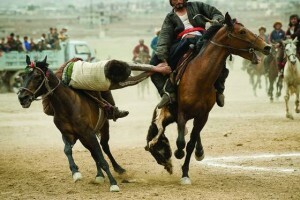 Buzkashi, literally, means “goat grabbing.” It is a brutal game that is played on the backs of trained horses. There are different formats of the game but usually a headless carcass (a goat) is placed in the center of a circle and surrounded by the players of two opposing teams. Both the teams compete to get control of the carcass and bring it to the scoring area which is usually a few kilometers away from the starting point. Points are awarded to the teams on the basis of successful completion of the task of getting control of the carcass and bringing it to the scoring area. Just like in any other sport, coordination and teamwork in absolutely essential in Buzkashi. It is a fierce game and requires years of practice for those who play it. Since winning and losing a game of Buzkashi is a matter of honor and pride for the whole tribe, usually the best and strongest young men of a tribe would constitute the team. The signal from the winning tribe is clear: our young men are powerful and skilled. The losing team would prepare more extensively for the coming year to take revenge of this year’s defeat. The games tell so much about the culture of a society in which they are played. The Pashtun (or Afghan) tribes live by a centuries old honor code: Pashtunwali – which literally means ‘the way of the Pashtuns’. The key codes of Pashtunwali are: Nang (A Pashtun must ensure his honor and that of his family and tribe); Badal (revenge and a violent reaction to a death, injury or insult); Melmastia (Hospitality and protection offered to all visitors without expectation of favor). Some values of the Pashtunwali are evident in Buzkashi. It is thus very important to know about the cultural values of a nation before understanding their traditional sports. Gaspari Cordova, A Humphrey Fellow from Belize studying Higher Education Administration, Junior Colleges, and Adult Education in the College of Education, Penn State University, introduces this year's Humphrey Fellows and invites others to connect with them.